The idea of digital lenses may conjure up futuristic, electronic eyewear that gives you heat-detecting vision and the ability to zoom in real life, but the truth is that digital lenses look exactly like traditional lenses in a side-by-side comparison. There are no batteries involved! Digital lenses, also called high-definition or free-form lenses, are much different when you see through them, however. Every eye is different, so getting digital lenses vs. traditional lenses is like the difference between getting an outfit off the rack and getting something made especially for your body to fit all of your various measurements perfectly. With high-definition digital lenses, the creation process takes into account the position of your pupil, the angle of the lens in the frames, and the shape of your frames. Many wearers also benefit from the ability to create progressive lenses that give you a similar effect to bifocals, but without an obvious line. Wearers find that their eyes are much more comfortable and it’s easier to adapt to the high-definition vision they have using a more gradual transition. High-definition digital lenses are made with an optimized computer-controlled scanning process which allows for much greater precision than how regular glasses are made. Conventional tools don’t allow for the same sort of control so they can lead to a perfect prescription for your eyes that still feels like it could be sharper. The way conventional lenses are made will sometimes create spots that aren’t as clear, or a bending effect toward the edges of your peripheral vision because of the shape of your glasses. This is not an issue with digital lenses. You will have better peripheral vision, less glare, and improved contrast sensitivity. To further improve the creation process, your eye care professional will usually take some added measurements based on your frames. This will ensure an exact fit and tailoring to your eye and eyewear choice. Further considerations for digital lenses include the question of who can benefit from them. The great thing about digital lenses is that everyone can benefit from them! People with difficult prescriptions, astigmatism, and presbyopia (farsightedness) will see the greatest change between traditionally manufactured lenses and their new, high-definition vision with digital lenses. The next question is one we hear a lot: but how much extra do they cost? Unlike the price difference between a high-definition television and the old tube models, digital lenses are not too much extra. They are more labor-intensive to create, so typically you can expect to pay about 25–35% more for your lenses. Once you become accustomed to the high-definition lenses and sharper vision, you’ll be surprised how inadequate your old lenses seem! 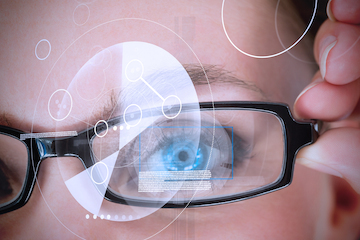 Talk to your eye care professional if you’re interested in getting digital lenses for your eyewear.